Geometry games let kids explore the world of geometry in a fun and engaging manner. Geometry games can be a very important tool in understanding complex geometric concepts, and instructors can benefit greatly from encouraging students to play interactive geometry games online. Geometry games take advantage of one of the most salient features of geometry – the fact that it can be visually represented. Unlike any other mathematical subject, much of geometry is present in the concrete world around us, and is therefore easy to represent in meaningful pictures and images. 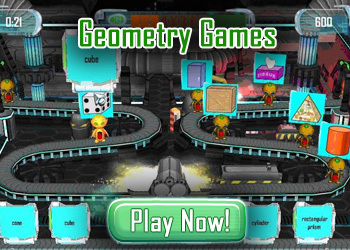 Interactive geometry games allow players to manipulate these geometric shapes and figures, and experiment with it in various ways. This sort of play is very valuable and can help greatly in enhancing a person’s ability to visualize and understand geometric concepts in the classroom. Through fun geometry games, kids can experiment with symmetry, the relationships between various shapes, tessellations, geometric measurements and many other important geometric concepts. There are plenty of websites that have good online geometry games for kids. These fun and interactive geometry games make geometry seem like pure fun, which is not far from the truth! Parents and teachers can take advantage of this valuable learning tool to help children excel at geometry in school!